Princes Bridge was designed by Jenkins, D'Ebro and Grainger and constructed in 1886-88 by David Munro. The bridge, completed in 1888, was the third bridge across the Yarra at that location. The first two bridges had been built in 1845 (timber) and 1850 (stone) in response to the need for a permanent river crossing into the city. The earlier bridge was named after the Prince of Wales, later Edward VII, and the name has survived through to the current bridge. Princes Bridge is a three span curved iron plate girder bridge with coursed rock-face bluestone block-work piers, abutments and wing walls. The upper sections of these have dressed granite and sandstone details. 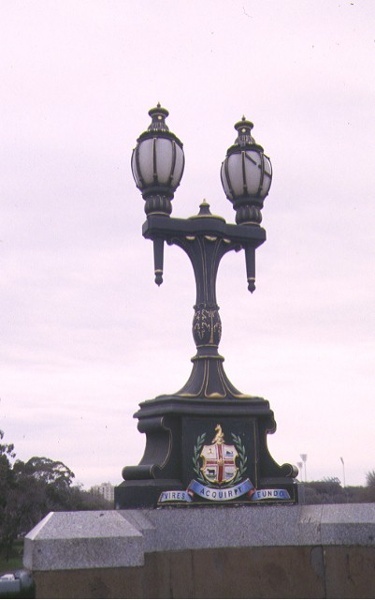 The decorated cast iron spandrels feature coats of arms, including those of the State of Victoria, the City of Melbourne, the Royal Arms and six of the seven municipalities that contributed to the cost of the bridge. For no apparent reason, that of the Shire of Malvern was omitted. The mouldings and cast iron balustrade along the top of the bridge and the lamp standards crowning the giant half columns are notable elements. Princes Bridge is of historical significance for its role in the early establishment of main thoroughfares in and around the city. It is the third bridge at this site since the first timber bridge was built at this location in 1845. In 1885, seven municipalities agreed to contribute to the cost of the bridge, including South Melbourne, Prahran, St Kilda, Malvern, Brighton, Caulfield and Moorabbin, and its construction provided an important link between the city and ships anchored in Port Phillip Bay. These early thoroughfares, and in particular river crossings contributed greatly in forming the shape of the city. The bridge played a significant role in linking port, recreational and industrial facilities with the city, facilitating the economic, suburban and demographic development of Melbourne. 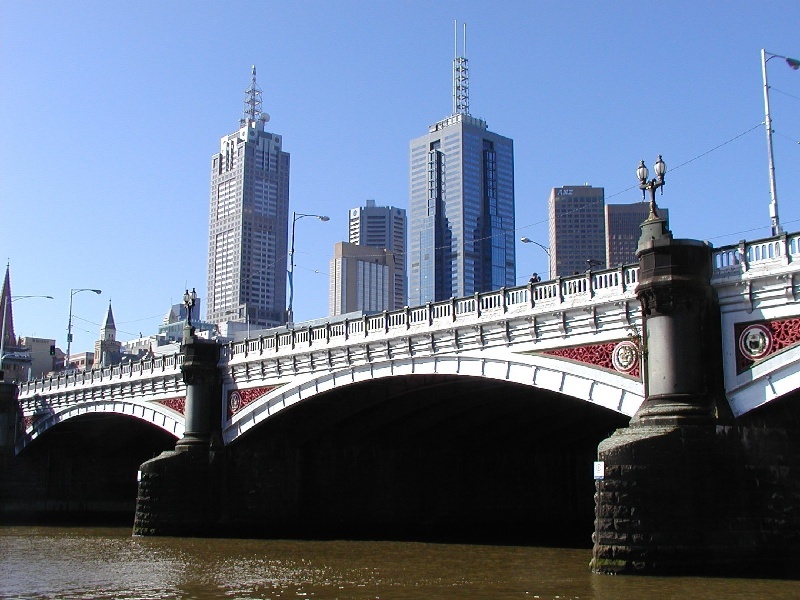 Built between 1886 and 1888, the bridge is of historical importance as it represents a boom period in Melbourne, when a tremendous increase in traffic partly stimulated the requirement for a new, larger bridge. 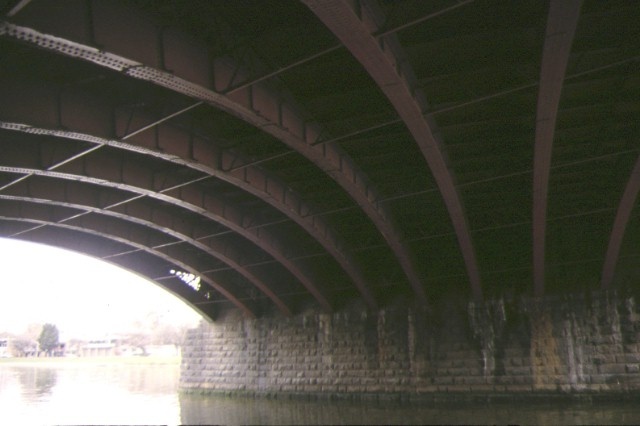 Princes Bridge is of architectural significance for its substantial size and for the skilled stonemasonry demonstrated in the construction of the abutments and piers. Architectural details of particular note are the arched girders and the cast iron spandrel panels which contain the coat of arms of each municipal council, except Malvern, who contributed towards the cost of construction. The bridge represents a notable example of the work of contractor David Munro. Munro was also responsible for the construction of Queens Bridge and Sandridge Railway Bridge and who was a prominent contractor and speculator during Melbourne's boom period of the 1870s and 1880s. 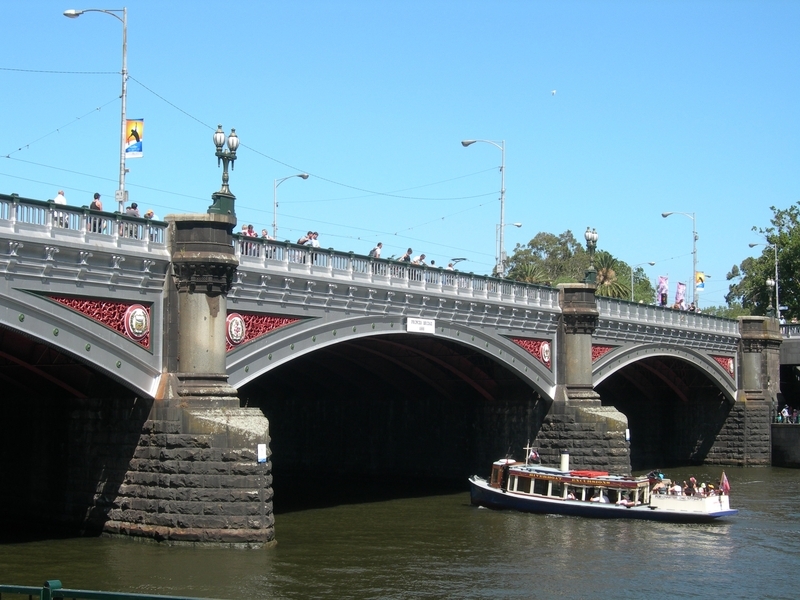 Princes Bridge is of aesthetic and social significance as Melbourne's grandest bridge and as an important and prominent landmark. 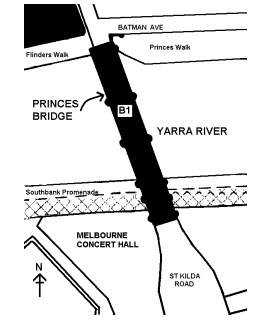 It is a contributory element in the distinct series of bridges which cross the Yarra within the city vicinity. The bridge is a symbolic entrance to the city of Melbourne and lies on the main axis of Swanston Street, St Kilda Road and the Shrine of Remembrance. Princes Bridge, St Kilda Road over Yarra River, Melbourne, Melbourne City Council. 1. To the extent of: All the structure known as Princes Bridge including all of the structure, its approach spans, abutments and wing walls as marked B1 in Diagram 603515 held by the Executive Director. In Melbourne punts were operating across the Yarra River at the city and Richmond in the late 1830s. 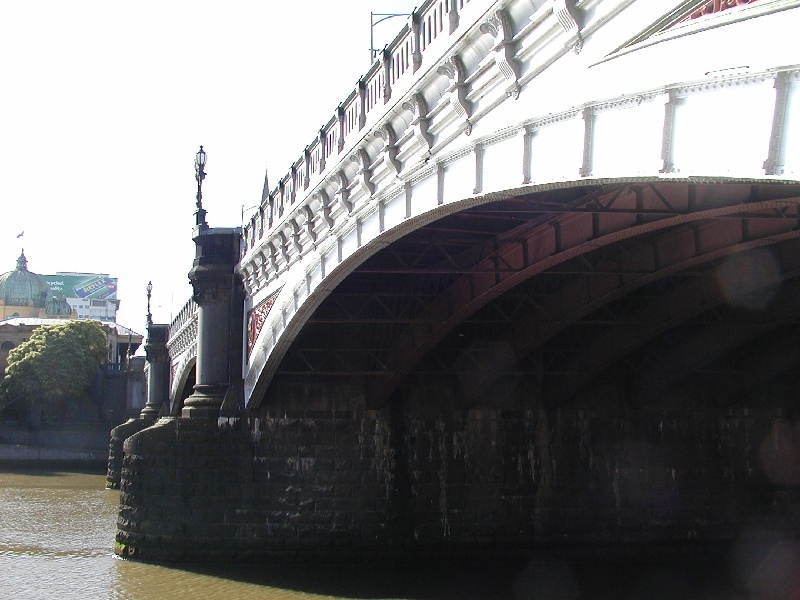 In 1845 the Melbourne Bridge Co. was licensed to build an iron toll bridge below the present site of Princes Bridge, but could only raise enough capital to erect a wooden bridge. The company charged pedestrians crossing the river 1d each; cattle and horses 2d a head; horse and bullock drays 6d; and private carriages 1s each. The significance of such early developments was that they established main arterial routes for all time, regardless of future needs or sound engineering principles. By the time increasing traffic forced government authorities to intervene and build public bridges, the shape of cities and near suburbs had been determined by thousands of private decisions and accidents of fate . 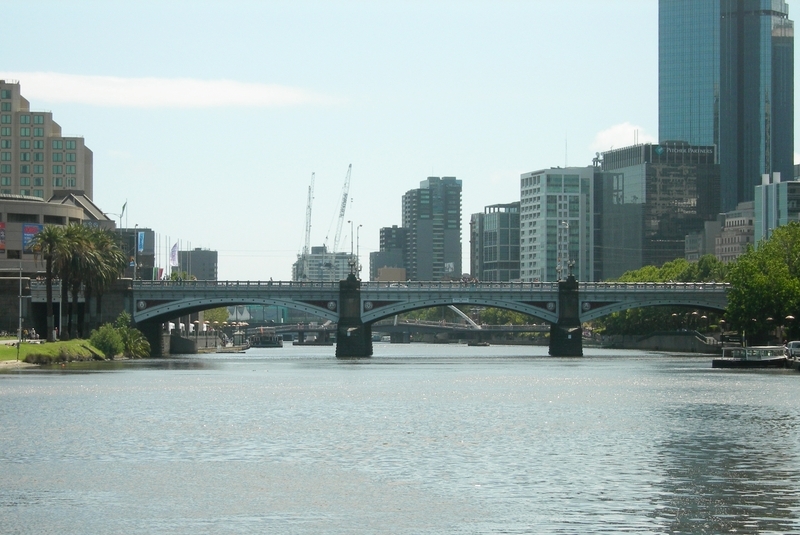 The need for a bridge across the Yarra was recognised in the earliest days of the settlement, but not until 1845 was the first of the three Princes Bridges built to give a more direct connection for ships anchored in the bay. Until then, passengers and luggage were transferred to either flat bottomed barges or boats which put them ashore at Williamstown, leaving them an uncomfortable nine mile journey by horse or bullock dray to the settlement. Alternatively, passengers were loaded into small craft which took them about the same distance up the river. The quickest way was three miles overland from Port Melbourne, but only inadequate ferries were available at the river to take passengers across the main settlement on the other side . The present Princes Bridge built in 1888 is the third bridge across the Yarra at that location. The first two bridges built in 1845 (timber) and 1850 (stone) were built in response to population explosion of Melbourne, from several hundred to over 80 000 people caused by the gold rush . The first bridge over the Yarra, a wooden toll bridge, was built by Alexander Sutherland on this site in 1845. It was replaced by a single-arched stone bridge in 1850, named Princes Bridge after the Prince of Wales, later Edward VII . It had a span of 45.7 metres and was one of the longest bridges in the world at that time, being only less than a metre shorter than London Bridge. The stone arch bridge was designed and built by engineer, David Lennox, and opened by Governor La Trobe on 15 November 1850, a few days after the passing of the Separation Bill, thereby laying the foundation for the proclamation of the State of Victoria in 1851 . The cost of the bridge was over £200 000, the balance of the total cost being paid by the Government . The present Princes Bridge, designed by D’Ebro and J.H. Grainger (the father of Percy Grainger, the musician) and built by David Munro, was opened in 1888. The abutments, piers and wing walls are made of bluestone quarried from Footscray, a stone which features in many earlier Melbourne buildings. The contractor engineer was George Higgins M.C.E., and John Monash gained some of his early experience on this project . The majority of the bluestone was obtained from the contractor’s (David Munro) quarries at Footscray, which were opened for this purpose, a siding being land into them from the Sandhurst line and a siding to the site of the bridge from Princes Bridge Station Land. The largest stones used weighed 17 tons in the rough and these finished may be seen in the cutwaters on the piers, just below the granite columns. The Malmsbury stone, a finer, softer and cleaner species of basalt, used for the carving and the more finely finished work, was obtained from the contractor’s quarry at Kyneton, and the granite from Harcourt. The iron for the bridge was specially rolled and workshops were erected in South Melbourne for the construction of the girders . Princes Bridge is very similar in appearance to Blackfriars Bridge in London . A special ‘City Arch’ was built over the bridge during the Federation Celebrations in 1901 . 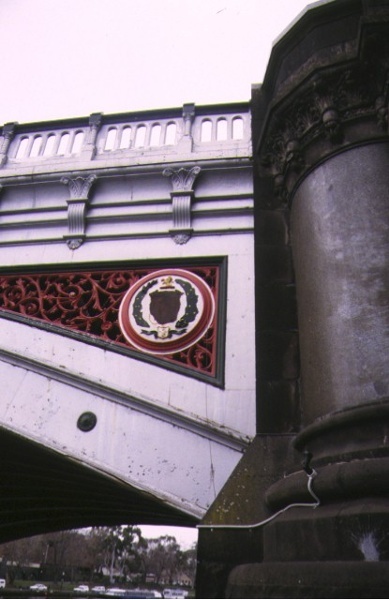 The decorated spandrels feature the coats of arms of municipal councils who contributed towards the cost of construction, the mouldings and balustrade along the top of the bridge and the lamp standards crowning the giant half columns are notable features . David Munro, Contractor, (1844-98) Engineer, speculator, contractor, born in Scotland, came to Victoria in 1854. He worked with his father, John Munro, a blacksmith and contractor, in King Street, Melbourne. Following his father’s insolvency, David started his own engineering and machinery supply business. During the construction and railway boom of the 1870sand 1880s David Munro and Co. was one of the colony’s biggest employers of labour. They built the new Prince’s Bridge in 1890 for45 000 pounds. Other railway contracts included the Fitzroy-Whittlesea Line for 100 000 pounds and the Frankston-Crib Point Line for 53 000 pounds. Munro was president of the Chamber of Commerce. He was a brother of James Munro, the notorious “land boomer” and became involved in land speculation himself through his close links with Thomas Bent. Munro and Bent shared the construction of the Nepean Road tramway and were directors in the Brighton Gas Co. Ltd.
David Munro’s end was a tragic one. By 1889 he was in serious financial difficulties, which involved all members of his family. His losses on contracts amounted to 90 000 pounds. He and his wife moved from their mansion in Kooyong to a small cottage in Parkville where, in March 1898, Munro died of a haemorrhage and alcoholism . In 1885 seven municipalities agreed to contribute to the cost of Princes Bridge. The municipalities included South Melbourne, Prahran and St Kilda (£10,000 each), Malvern (£2,500), Brighton and Caulfield (£2,000 each) and Moorabbin (£1,000). It was intended that the respective coats-of-arms or municipal seals of these seven contributing municipalities were to be placed on the sides of the bridge, along with the arms of the State of Victoria, the City of Melbourne and the Royal Arms. However the seal for the Shire of Malvern is the only one not evident on the bridge and there is no indication that the seal was ever installed. No reason has been found for this omission. Completed in 1888, this bridge was the third constructed at this location. Designed by Jenkins, D'Ebro and Grainger and built by contractor, David Munro, it played an important role in the development of Melbourne's southern suburbs. * No permit required to replace like with like on the Princes Bridge General Conditions: 1. All exempted alterations are to be planned and carried out in a manner which prevents damage to the fabric of the registered place or object. General Conditions: 2. Should it become apparent during further inspection or the carrying out of works that original or previously hidden or inaccessible details of the place or object are revealed which relate to the significance of the place or object, then the exemption covering such works shall cease and Heritage Victoria shall be notified as soon as possible. Note: All archaeological places have the potential to contain significant sub-surface artefacts and other remains. In most cases it will be necessary to obtain approval from the Executive Director, Heritage Victoria before the undertaking any works that have a significant sub-surface component. General Conditions: 3. If there is a conservation policy and planall works shall be in accordance with it. Note:A Conservation Management Plan or a Heritage Action Planprovides guidance for the management of the heritage values associated with the site. It may not be necessary to obtain a heritage permit for certain works specified in the management plan.